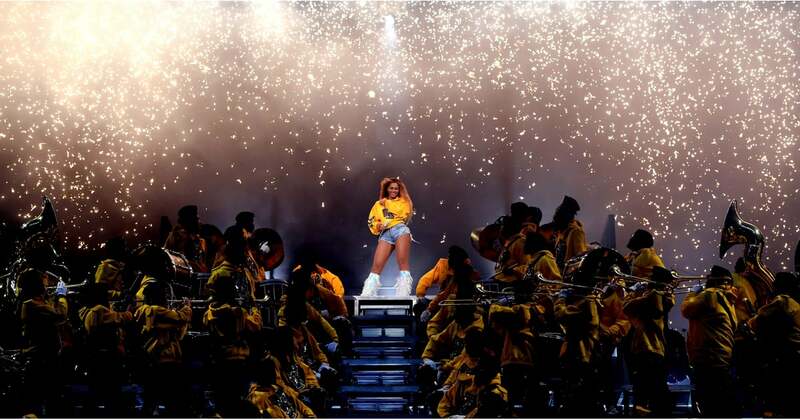 Last year, Beyoncé commanded the stage with an incredible performance at Coachella, dazzling the crowd with a bevy of hits including "Formation," "Sorry," "Crazy in Love," and "Drunk in Love." And now, she's taking us behind the scenes of the iconic performance through her Netflix documentary Homecoming and an accompanying album, Homecoming: The Live Album. In 2018, Beyoncé made history as Coachella's first black female headliner, and her two-hour-long performance paid homage to HBCU traditions, marching bands, probates, and step competitions. The singer wore not one but five custom Balmain designs during her set. As you get ready to watch the documentary (or rewatch for the second time), relive every moment from Beyoncé's Coachella performance in photos here. Good Luck Keeping Up With All These Fun Snaps of Stars at Coachella!